A program designed to improve the quality of life for lymphedema patients is now available through NorthBay Rehabilitation Services at Vacaville Millennium Sportsclub. Lymphedema is an accumulation of lymphatic fluid that can cause abnormal swelling anywhere in the body, but most typically in an arm or leg. 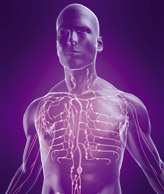 It develops when lymphatic vessels are damaged or lymph nodes are removed or missing. Surgical procedures or radiation therapy in the treatment of breast cancer can cause lymphedema if the lymph nodes are damaged or removed. “Removal of the lymph nodes impairs the lymphatic fluid from flowing on its normal pathway throughout the body,” explains Heather Rose, a certified lymphedema therapist at NorthBay Rehabilitation Services. The goals of the program are to reduce the volume of the edema, improve the health of the tissue, and to teach patients how to maintain the treatment effects for the rest of their lives, she says. Initial treatments are daily and include manual lymphatic drainage (a gentle massage-like technique designed to assist the transport of lymphatic fluid out of the limb), compression therapy, skin care, exercise and patient education. For more information about the Lymphedema Management Program, call (707) 624-7470.